James Kent (left) and David Haussler (right) received the 2009 Curt Stern Award. 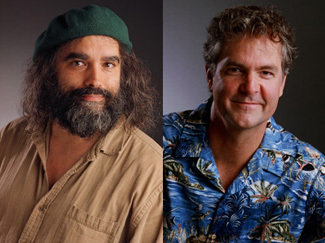 The American Society of Human Genetics (ASHG) has honored two researchers in the Jack Baskin School of Engineering at UC Santa Cruz with the 2009 Curt Stern Award. David Haussler, professor of biomolecular engineering, and James Kent, a research scientist in the Center for Biomolecular Science and Engineering, will accept the award on October 24 during the annual meeting of the ASHG in Honolulu. The Stern Award is presented for outstanding achievements in the field of human genetics during the past decade. Haussler and Kent were selected for their contributions to genetic research through the conception and development of the UCSC Genome Browser, which "continues to have a significant impact on a wide variety of research applications throughout the human genetics community." Haussler and Kent are credited with the assembly and public release of the first "working draft" of the human genome in June 2000. Haussler is the director of the Center for Biomolecular Science and Engineering at UCSC, codirector of the California Institute for Quantitative Biosciences (QB3), and a Howard Hughes Medical Institute investigator. His research focuses on the comparison of DNA sequences between a wide range of species in an effort to identify functional regions and gain insight into evolution. Haussler's previous awards include the International Society for Computational Biology (ISCB) Senior Scientist Accomplishment Award in 2008 and the Carnegie Mellon University Dickson Prize for Science in 2006. He is a fellow of the American Association for the Advancement of Science and the Association for the Advancement of Artificial Intelligence, and a member of the National Academy of Sciences and the American Academy of Arts and Sciences. Kent is director of the UCSC Genome Browser project, which provides researchers around the world with free access to a wide variety of information about the human genome, including its complete available sequence and those of other animal species for comparison. Supplementing these sequences, the UCSC Genome Browser incorporates data and links to research on countless regions of functional DNA. Kent was awarded the Overton Prize for outstanding achievements in computational biology by the ISCB in 2003. His work on the human genome project was also featured in the 2007 book Beautiful Code.